Craig was paralyzed in a skiing accident in Steamboat on March 26, 1996 and has since dedicated his life to encouraging people with disabilities to travel and adventure to their fullest. Craig has over ten years of experience in motivational and inspirational speaking to top spinal cord rehabilitation centers, independent living centers, high schools, colleges, and youth organizations throughout the United States, and has spent the past seven years speaking and teaching marketing strategies throughout the United States. It is his vision to break down barriers while educating and spreading awareness of the growing need for better accessibility, and to help create a world that is designed with all people in mind. Shortly after co-founding Access Anything, a nationally recognized leader in adaptive sports and adventure travel for people with disabilities, (est.2003), Craig opened CK Consulting in 2004 for ADA consulting. Craig’s consulting experience is vast, from developing an access assessment tool for Colorado Scenic Byways to training Steamboat Ski and Resort Corporation’s entire staff on handling customers with disabilities, to individual business access assessments. Craig is also a certified CRO (Complaint Resolutions Officer) trainer for the airline industry, and works with the Open Doors Organization for those as well as the Ground Crew “Stowage” training for several airlines around the globe; his furthest training was to London to prepare Heathrow Airport for the 2012 Summer Olympics and Paralympics. Since 2006 Craig has worked tirelessly at bringing adaptive sports camps to Steamboat with partners Adaptive Adventures. In March of 2010 these skiing, waterskiing, cycling, and fishing camps rolled into the Steamboat’s new non-profit adaptive program STARS. In October of 2010 Craig was hired as the Program Director for STARS, and has spent the last year years building a stronger volunteer instructor base for the program, as well as growing its staff, and growing its programming to include a full summer of day camps in a huge variety of sports. During this time Craig has also proudly achieved his level 1 and level 2 Adaptive Certifications from Professional Ski Instructors of America (PSIA). Craig also has a passion for volunteering, and has served as a member of the Steamboat Springs Chamber Resort Association‘s volunteer Ambassador team from 2004-2008. He also served three years on the Board of Directors for Partners in Routt County, a youth mentoring program, for three years and has served on the Continental Airlines Customers with Disabilities Advisory Board, now the New United Accessible Travel Advisory Board, since 2008. Craig prefers skiing the powder stashes of Steamboat to just about anything, and has gotten well over 1200 days on his Revolution Monoski since re-learning to ski in 1997. He's long overdue for a new one, so if you have any leads on a barely used $1000 Bramble, send them his way! In the summer months he loves adaptive golfing and downhill mountain biking on those same Steamboat slopes. And there isn't a day that goes by that Craig and Andy don't miss their 120lb. 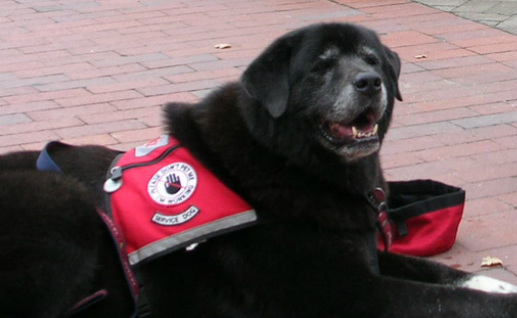 Newfoundland Service Dog Mohawkie (1996-2007). Andy grew up in northern Virginia, got her degree in Visual Arts from Eckerd College in 1995, and after living in Eugene Oregon and Glasgow Scotland, Andy moved to Steamboat Springs “just for a summer” in 1998. Andy and Craig started Access Anything in 2003 after a trip to Alaska opened their eyes about the many interpretations of “accessible.” From there they published two guidebooks, Access Anything Colorado and Access Anything I Can Do That, and began marketing and educating on all aspects of disability travel including recreation, adventure, eco-travel, and ADA rights and interpretation. Andy’s background in travel writing and photography has lead her to author two blogs for Access Anything, Travel and Reviews, as well as its newsletter, The Traveler (2006-2011). She has written frequently for magazines such as Action (United Spinal Publication), Palaestra, Sports N Spokes, and Wheelin’ Sportsman. She has photographed the adaptive camps in Steamboat since their inception in 2006, and enjoyed every minute of it. She has also volunteered her photographic services for the bi-annual No Barriers Festivals (2007 Tahoe, 2009 Miami, 2011 Winter Park) and is excited to head down to Telluride for No Barriers 2013! Andy has also worked with the Open Doors Organization, helping to run a twelve-month training program for Amtrak in 2011, and consulting on many other projects as well as maintaining their website and social marketing through fall of 2012. Both Andy and Craig sit on the United Airlines Accessible Travel Advisory Board (since 2011), which was merged with the Customers’ with Disabilities Advisory Board for Continental Airlines (since 2008). As of early 2012, Andy’s primary focus is on sustainability. She joined the Yampa Valley Sustainability Council’s Board of Directors in 2008. In 2011 Andy was hired as the Zero Waste Initiative Program Coordinator, and in May 2012 was promoted to Program Director. Andy is very passionate about sustainability and green living, and has been recycling since she was 11 years old. The Kennedys compost their food waste, maintain two gardens and grows tomato plants year-round, and live as green as possible despite not yet having built their dream home, an off-the-grid Earthship. No moss grows on Andy's stone, she stays busy with her two other companies as well: AJDesign and Photography, which she founded in 1994, where she combines her innate artistic abilities with the marketing experience she's learned over the years from Access Anything. Artwork includes design such as logos and brochures, wedding and real estate photography, as well as traditional and modern calligraphy, which she also teaches at the local Art Gym. AJDesign also consults with individuals on social marketing, time efficiency, small business web development and office organization. Andy also started Innerself Lightworks in 2002, a holistic health business that uses a combination of techniques including Reiki, crystals, meditation, spirit guidance, Astrology, Numerology, Earth Acupuncture, and Andy’s intuitive wisdom for guiding individuals back to mental, physical, and spiritual balance. She teaches classes on crystal healing, synchronicity, intuitive growth and finding your dharma through Innerself Lightworks' newest addition, the School of Light. Andy also manages two personal blogs in her spare time: Andy’s Idea Factory and In The Deep Steamboat.